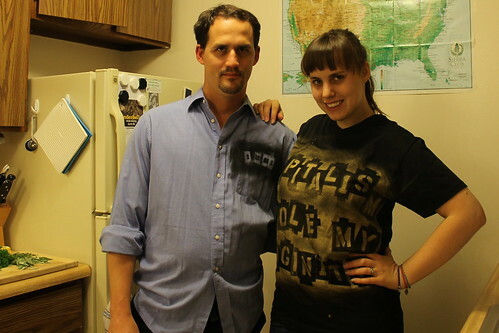 For this week's DI(fr)Yday, I'm making punk rock shirts for myself and Ryan. I've made a step-by-step tutorial so you too can customize and make one for yourself or a loved one. 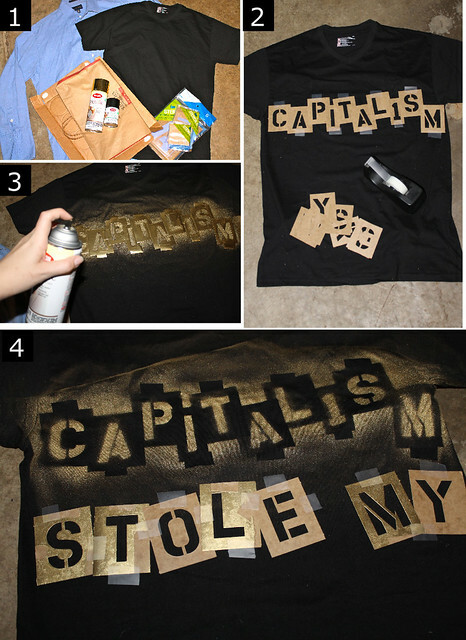 - After placing a paper bag or similar between the layers of your shirt to prevent bleeding, arrange stencils to spell out your message. Band names or lyrics are a good way to go. My shirt say "Capitalism stole my virginity," which is the name of at (International) Noise Conspiracy song, as well as just a really cool thing for a shirt to say. 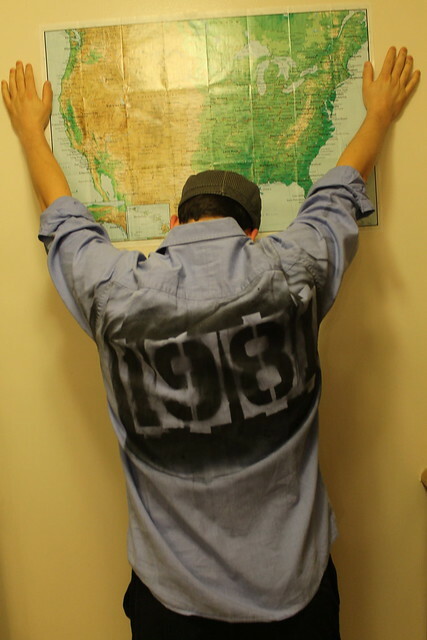 For Ryan's shirt, inspired by The Clash's 1979 Tour, I used his birth year 1981. 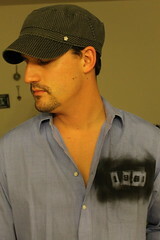 - Tape the stencils in place so they won't blow away with the force of the spray paint. 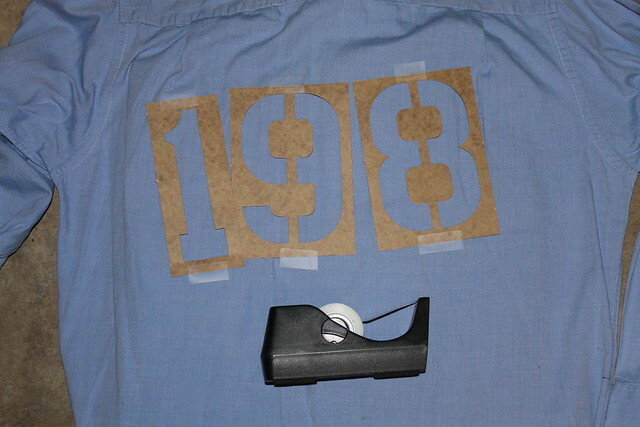 You can use double sided tape and hide it under the stencil if you don't want the tape lines to show. For mine, however, I wanted as messy and haphazard a look as possible, so I allowed the tape to show and arranged the letters a bit wonky. - Follow the instructions on the can. Mine advises shaking the can for a full two minutes, holding it about six inches from the surface, and waiting two hours before handling. I did this in the garage to prevent fumes from gassing up the whole house; I recommend it. I also recommend dancing around to Ramones' songs while shaking up your spray paint as it makes the whole process much more enjoyable. Step 4: Arrange more stencils and spray once again. - If a stencil needs to be repeated and you only have one, you will need to spray the full message in steps, waiting for the paint to dry before moving the stencil and spraying again. 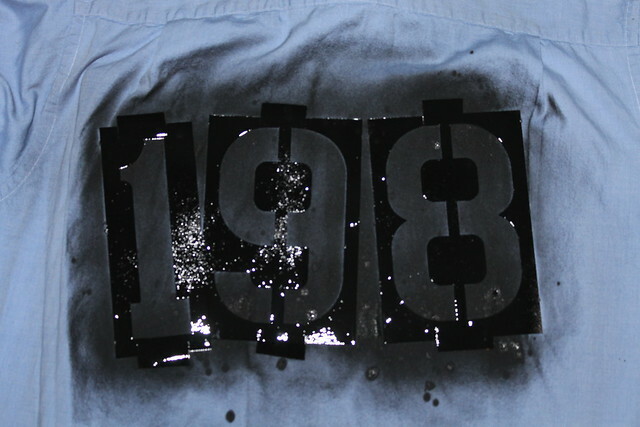 Take care to keep the area where the stencil will be moved clean when you do the first layer of paint. 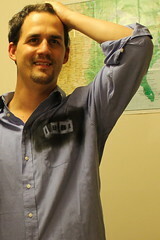 See below for an example of how I moved the 1 on Ryan's shirt for a second coat. I hope you enjoy this tutorial. Remember to stay calm and just roll with it. Things don't have to be perfect for this project to work. In fact, the more imperfect you shirt is, the more punk rock it will be. That's a great idea for a t-shirt! I'm bookmarking this for the next time I have a show/concert to attend. I think it would be so sweet to make a band tee and tuck it into a pair of high waisted jean shorts! Come check my blog out too! 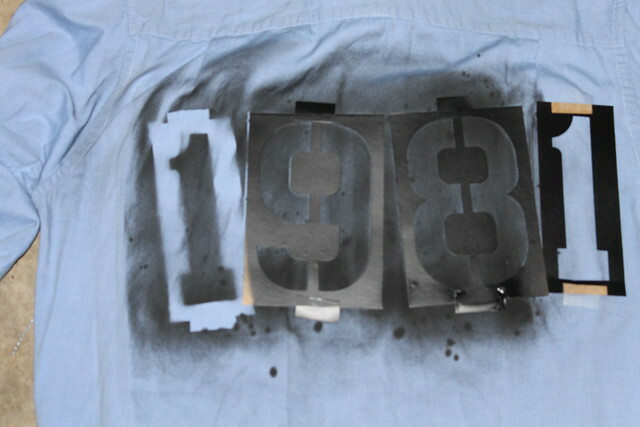 I'm SO gonna go buy spray paint now! great idea!